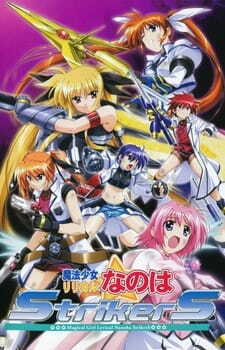 Nanoha is back four years later after the events of the prequel in Mahou Shoujo Lyrical Nanoha StrikerS. The time there is more action, more new characters, and more different than the original story. Set 10 years after Mahou Shoujo Lyrical Nanoha A's, Nanoha, Fate, Hayate and the rest of the crew are now working full time in the Time-Space Administration Bureau. Nanoha is a combat instructor, Fate is a special investigator, and Hayate is a commanding officer. They must unite once again to save the dimensions. Introducing new characters as well: Subaru, Teana, Caro and Erio. Stand by. Ready. Set up! The story takes a huge jump after the events of the prequel and is now set four years later when Nanoha has finally grown up to be 19 years old. The anime takes an unexpected turn into the military genre as Nanoha and her friends are now working in a government section uncovering the mysteries of the Lost Logia. The anime introduces some new characters that joins the team. However, we never got to saw what happened to Nanoha's old friends from the previous sequel. What happened to the rest of the characters? There was a huge plot hole here that was never covered. In the end, this sequel was much longer than the previous two which the story was much more larger and grander than before. You could say that you can totally engross into the story from start to finish. There were a mixed bag of emotions throughout the anime from being happy, sad, emotional, frustrated, and angry. This was a well constructed ending to a nice trilogy. The art was improved and spectacular this time. The character's costumes and transformation sequences all looked great. Facial expressions and character personalities were well illustrated and portrayed in the anime. The weapons looks bigger and better, and the battle animations were more fierce. You could say that the art style has drastically improved from the sequel, adding more of a darker tone than usual. Voice acting was rather excellent for most characters in the anime. The main characters are all well cast but some villain characters such as the evil doctor's voice acting, got on my nerves. The music is pretty good too, the first set of opening and ending themes are great but the second set was noticeably weaker. They also toned down the repetitiveness of background music but it was still slightly noticeable. It took a while to get used to Nanoha and her old friends since everyone has grown up. It was like watching a whole new series with the same faces and names. However, the introduction of many new characters made the anime more alien than ever to the prequels. I pretty much had to "get to know" everyone in the anime again. Some random characters were thrown in, but they did not provide enough background information as to why they were there. Also, some character's relationships have changed slightly and I felt that there was some missing back story that should of explained the current situation. Overall, it was slightly disappointing to see some lack of cohesion and relevance to the sequels. I felt that there were too many details left out. It would have been great if there was some OVA or a short series to fill the major gap but there was none. In the end, you have to accept what is given to you and to pretend the missing characters from the prequels disappeared. I felt like that this anime has drifted away from the "magical girl" genre and into "super power/military/sci-fi" territory. A decent story with some nice villains to deal with. However, many plot holes exist. Improved visuals and battle animations from the sequel. Voice acting was rather excellent with some minor annoyances with some characters. New characters are a good thing but don't forget the old ones! It was nice to see a more serious "magical girl" anime. Putting the plot holes aside, it was one enjoyable anime to watch.